All three Dartmouth College psychology professors accused of sexual misconduct have now left their positions after a nearly yearlong investigation, college officials announced Tuesday. All three Dartmouth College psychology professors accused of sexual misconduct have now stepped down from their positions after a nearly yearlong investigation, college officials announced Tuesday. William M. Kelley resigned effective immediately after Dartmouth administrators recommended that the school revoke his tenure and end his employment, president Philip Hanlon announced in an e-mail to students and alumni. In June, longtime Dartmouth professor Todd Heatherton retired and Paul J. Whalen resigned. Heatherton, Whalen, and Kelley were professors and well-known researchers in Dartmouth’s psychological and brain sciences department. Dartmouth has barred all three from campus and college-sponsored events, wherever they are held. Kelley could not immediately be reached for comment. The men had been on sabbatical and paid administrative leave since last summer, when the college launched an investigation into accusations of misconduct. Their abrupt departures roiled the campus and sparked a criminal investigation by New Hampshire Attorney General Gordon J. MacDonald last fall. That investigation is ongoing. On Tuesday, Hanlon said the college continues to cooperate with law enforcement officials in their criminal probe. He acknowledged that the past few months have been challenging for the Ivy League school. “We are committed to improving our culture as we seek a safe and inclusive environment for all members of our community,” Hanlon said. The college has yet to comment on what the professors were accused of doing. 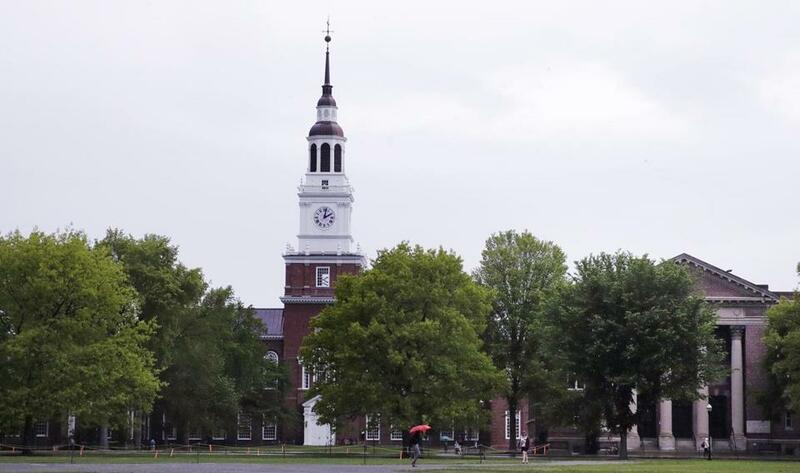 Last November, 15 Dartmouth College students, whose names were not disclosed, submitted a statement to the college newspaper alleging the professors had created a hostile academic environment. The unnamed students said they felt pressure to socialize and drink with the professors to further their careers. After Dartmouth launched its investigation, reports surfaced that Heatherton had groped women in 2002, including at professional events. Heatherton, in a statement announcing his retirement, said he had acted “unprofessionally” at conferences and blamed alcohol for his behavior. can be reached at deirdre.fernandes@globe.com. Follow her on Twitter @fernandesglobe.